On Saturday thousands of high school students will sit down to take the ACT exam. If your students are going to be taking the test, they could benefit from using PrepFactory to review before Saturday's exam. PrepFactory offers free ACT and SAT review activities. When students sign into PrepFactory they are asked to identify which exam they are preparing to take. If students select ACT, they will be shown a screen that has four sections representing the topics students need to review for the ACT. Those four topics are English, math, reading, and science. Students can start their reviews within any of those four sections. Each section contains many sub-topics for students to review. The question formats within each review activity are fill-in-the-blank, sorting, multiple choice, and short response. PrepFactory isn't just a set of practice problems. 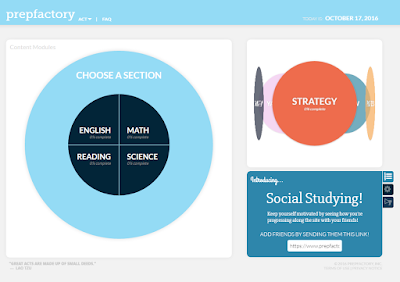 PrepFactory provides students with text-based and video tutorials before each set of practice activities. For the student who doesn't feel like he or she needs the tutorials, there is an option to skip the tutorials and go straight into the practice questions. Besides ACT and SAT prep, PrepFactory offers skills development activities for middle school students. You can learn more about those activities in this post that was published in September.